Yes, and volatiles, mostly water, along with the action of the biosphere have erased much evidence of the heavy bolide and plenetesimal strikes. The first clue to what is now known as the Chicxulub impact was the uniform layer of iridium which is found all over the planet. That sent people out looking for the evidence of the impact. Yes, elevations by geologists studying Mars always refer to elevation above or below the datum. I haven't used the term because i didn't want to assume that people would know what i was talking about. So, for example, the mean surface level of the Vastitas Borealis is about 1500 meters below the datum. The mean surface level of the Tharsis plateau is 7000 meters above the datum. The Southern highlands, the "chaoses" of the southern hemisphere are about 5000 meters above the datum. That means that the Vastitas Borealis is more than 20,000 feet below the mean surface level of the southern highlands. By the way, i should have said the mean surface level of the Tharsis plateau, not including the Princess volcanoes. Yep, that's the number. It says that they've used a "standard reference geoid model ". Im not sure how Mars varies . Earth, being pear shaped, has a geoid that varies several % from a sphere and the geoid "base level" varies throughout the planet. In US we use the gage systems to calibrate everything . surveying t its most accurate uses an electronic distance measurement (EDM) system. Almost everything else is GPS based. According to Wikipedia, the datum was arbitrarily selected to be the 6.105 millibar level. Below that figure, liquid water is not stable. The northern and southern hemispheres of Mars are differentiated by both topology and elevation. The southern hemisphere is characterized by highlands (relative to the northern hemisphere), the surfaces of which are called chaoses. They are called chaoses becuse of a fantastic mix of teatures, perhaps the most interesting being evidence of ancient liquid water, the flow channels of which just simply stop, for no discernible reason. The rest of the surface is characterized by cratering, ancient volcanism, uplift features that resemble pingoes, but on the gigantic Martian scale--in short, characterized by having no single characteristic features. There is a feature known as the Xanthe Terra which "sticks up" out of the southern chaoes, across the equator into the northern hemisphere. The southern end of this feature has the features of the southern chaoses, but the northern end of the Xanthe Terra is strikingly different. It shows the most prominent evidence of flowing water on the planet. Huge channels and vast alluvial fans. The flow which would have created them are, like everyihing else on Mars, on a gigantic scale--perhaps as much as 10,000 times the flow of the Mississippi-Missouri-Ohio drainage in North America. Where would that water have gone? Downhill of course, to what is known as the Vastitas Borealis (northern wilderness or northern wasteland). Those who support the hypothesis point to the uniform surface of the Vastitas Borealis, as evidence of an ancient sea bed (there are problems with this, though). They also point to evidence of what they say are ancient shorelines along the edges of the higher elevations in the northern hemisphere, which are all just north of the equator. The supporters of this hypothesis say that the features of the Vastitas Borealis are consistent with a sea bed. But there the controversy begins. Those who favor the short wet period point out the features of the Vastitas which are not consistent with a sea bed. There are large boulders on the plain of the Vastitas, and they could not have been carried there by water. There are also features which some researchers say resemble eskers, the saying of which is convenient to their hypothesis. 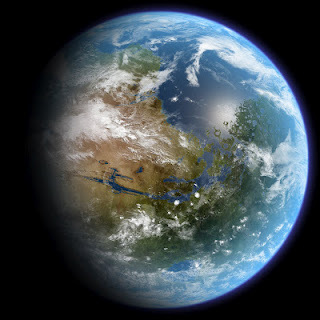 They allege that the northern half of the northern hemisphere was once covered by vast glaciation (on a typically Martian gigantic scale), which would account for the boulders and the eskers, if eskers they are. Proponents of this point of view contend that there was a very brief period when the glaciers melted, leaving the eskers behind. They are content that their hypothesis covers the data. The Red Planet Report states the the surface penetrating radar now in use tends to confirm the Oceanus Borealis hypothesis--without, however, resolving the completing claims of the long wet period group or the short wet period group. Just to muddy the waters, as scientists love to do, there is the episodic hypothesis, which you can read about in this PDF document, which is an abstract. None of those hypotheses, however, account for the difference in elevation between the northern portion of the northern hemisphere, and the southern highlands. The difference is on the order of 20,000 feet of elevation--roughly the height of Denali in Alaska (once known as Mt. McKinley). The hypotheses about an ocean on Mars don't answer the question of why the elevation is so much lower in the northern hemisphere. According to this hypothesis, near the end of the Noachian age, a gigantic planetesimal struck a glancing blow on the northern hemisphere of Mars. Proponents of this hypothesis say that it accounts for a lot of data previously unaccounted for, or not convincingly accounted for. The obvious one is an explanation of why the northern half of the northern hemisphere is at such a lower elevation than the southern hemisphere. There's more to it than that, of course. Martian rocks are said to have been found on Earth and it's moon. The impactor of which created the Hellas Basin would not have thrown ejecta that far, and if the Daedalia Planum is an ancient impact crater, even that massive strike would not have thrown ejecta that far (say the supporters of this hypothesis). The two moons of Mars--Phobos and Deimos ("Tear" and "Terror")--are thought to be condrite, and therefore not Martian ejecta. Which begs the question of how they got there. If they are, as is commonly thought, "asteroids" caught in a Martian orbit, what event sent them to Mars? The supporters of the Big Hit hypothesis suggest that the two little, potato-shaped moons are chunks of the planetesimal which broke off during the accidental "air-braking" as the plenetesimal entered the Martian atmosphere. In support of this idea, they point out that the two little moons "rise" in the west and "set' in the east. If you were in a spacecraft on the edge of the solar system, at the level of the plane of the ecliptic, all the planets would appear to move from your left to your right--from west to east. Those who support the Big Hit thesis say that the moons of Mars move from west to east because that is the direction their parent planetesimal was moving when it struck Mars. Their orbits are very low, too. Phobos circles Mars just 5000 kilometers above mean surface level. These people also suggest that the so-called asteroid belt was a product of the Big Hit. They contend that the "asteroids" are ejecta from Mars, and the remnants of the planetesimal which struck Mars. Some even go so far as to suggest that the rings of Saturn were formed from the volatiles lost from the Martian atmosphere and from outgassing as a result of the impact. I personally thing that is going a little too far, though. However, one of their important claims is that Mars lost as much as a quarter of its mass and most of its atmosphere due to the Big Hit. If that were true, that would mean that its gravity decreased from .5 G to .38 G, as it now is. That aspect of the hypothesis claims to account for the heavier, denser atmosphere prior to the Big Hit. Such an atmosphere would allow for the open water on the surface which cannot now exist due to the low atmospheric pressure. I beleive i'm correct in stating the the highest atmospheric pressures, in the lowest elevations are around 15 milibars. For comparison, the atmospheric pressure on earth is one bar, 1000 milibars, at sea level. I find this a fascinating hypothesis, and fully acknowledge that i don't have the knowledge to judge its plausibility. thanks for all the information. Gotta admit its mostly new to me since I rarely get involved in Martin geo. into a lump we call the moon. 1. The earth and moons plate of Oxygen isotopes are almost similar in the lunar soils and our Shield areas. 2. The percentage amounts of specific alkalis and rare earth elements(when measured together and each of their concentrations are added and called 100%) these percentages are identical between the specific elements between the two bodies (deposition of rare earths is mostly a mystery methodology except for a very few). All that means is that the deposits of lunar Rocks match the anorthosites of theCanadian ,Russian, nd Australian Shields exactly. Its been a reassembly of the first few continental drift events of the Hadean and Columbian events that occurred several billion years before the Pangean. All these areas were in close proximity to each other . It is theorized that `The moon just did a semi direct hit on the (then) earths pre-shield areas that were then coalesced in one big glop and then the proto moon glanced off into space and was quickly captured by the rule of conservation of angular momentum. I have a hard time with the mechanics of the theory so Im just saying that this is the story that best fits the evidence . But the geochemistry is pretty convincing that the earth and the moon were part of one body. Man, the early solar system was a shooting gallery of big-assed rocks. You know, while doing the reading for these posts, it occurred to me that Bewildered may have been taking the Big Hit ball and running with it. His timeline would not have been unreasonable for the Big Hit. He simply never gave credit where it was due. It would have been alarming to him to have thought of admitting that someone with genuine credentials came up with the hypothesis from which he constructed his fantasies.